A Cornish girl born and bred, I have always had a passion for the outdoor life and animals. My early years were spent helping on the family farm, charging around on my Dartmoor pony, Sherbie. I am one of that rare breed, a female keeper, and have been keepering for almost 14 years — just entering my fifth season as the underkeeper at the Underley estate in Cumbria. I first came to Underley at the age of 12. My mother and I had moved to a cottage on the estate and I signed myself up on hearing that there was a shortage of beaters. It was my first insight into the shooting world and little did I know that I would one day be helping to run the shoot. My first day’s beating was a soggy October morning. I was nervous, not having a clue what I’d let myself in for. But it was not long before I was armed with a stick and loaded on to the beaters’ wagon alongside men, boys and dogs. Despite the cold and the rain pouring in, the lads’ spirits never dampened and the atmosphere on the bus was great, full of chat, bad jokes and tales from wise old countrymen. 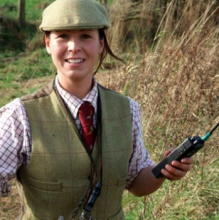 Female gamekeepers: Why are there so few female gamekeepers in our sport? I was totally hooked. You’d find me at the shoot every Saturday and during school holidays. I stashed my wages in a jar on top of the fridge to be invested in waterproofs, ferrets, dogs and, later, my first shotgun. I even did my school work-experience at Underley. It was July, and our days were mainly spent feeding as most of the birds were to wood. I found it hard at first. Struggling with the 25kg sacks, each bag took every ounce of my strength to carry, but I was determined to complete the task. I learned a great deal, loving every minute of working with the birds and checking traps. By the time I was 15, I had made up my mind — I desperately wanted to be a keeper. I knew it was unusual for a woman and that tradition dictated it was, almost exclusively, a male role. That said, I never realised quite how hard it would be to get started in the profession. There was hardly any advice available — my school’s careers advisor confused it with “greenkeeping”. Fortunately, my mother has always encouraged me to follow my dreams and assisted in the hunt for a suitable college course. When she rang the first college on our shortlist, the lecturer was very helpful — until, that was, he discovered the placement would be for a daughter not a son. I was instantly rejected, being told that the college could not find keepers who were willing to take on girls for the work placements required to complete the course and that the college had no facilities for females. We were truly shocked. Remember, this was barely a decade ago, when there were already plenty of women in other physically demanding jobs, including the British Army. I contacted Borders College next and was immediately accepted, spending the following two years completing both a National Certificate (NC) and Higher National Certificate in gamekeeping and wildlife management. My first few weeks weren’t easy; most of the other students had grown up with a shotgun under their arm or had an extensive gamekeeping pedigree, luxuries I didn’t have. I kept my head down and ploughed on through the first year and to my surprise won the NC Gamekeeper of the Year Award. There is no escaping it — keepering is a demanding job, getting started is tough, the hours are long and the stress levels high. As a female keeper, there have been additional challenges, but I now live in a beautiful part of the country doing a job I enjoy. I am so glad that I persevered.